Hurricane Odile to bring 21 months' worth of rain to Baja California, Mexico. 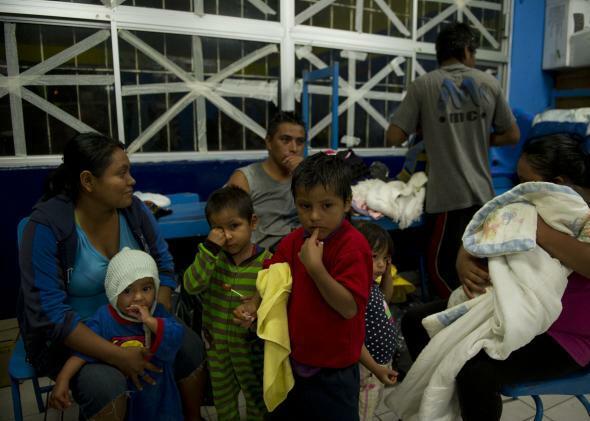 People gather in a shelter in Cabo San Lucas, Baja California State, Mexico, on September 14, 2014. Hurricane Odile swirled menacingly toward Mexico’s Los Cabos resorts on Sunday. An incredible amount of rain is hitting Mexico’s Baja California peninsula thanks to yet another rare hurricane passing through—the second one in the desert in barely more than a week. The latest in a string of exceptionally powerful storms—Hurricane Odile—made landfall late Sunday night near Cabo San Lucas on Mexico’s Baja Peninsula with 125 mph sustained winds. The National Hurricane Center warns that Odile could bring isolated rain totals of 18 inches to an area that typically gets only about 10 inches per year. (That’s like New York City getting seven and a half feet of rain.) It could remake the local geography and turn the desert into a temporary Niagara. Since comprehensive weather records began in 1950, only one other hurricane in that part of the world has been this strong at landfall, 1967’s Hurricane Olivia. On its approach to Mexico this weekend, Odile looked ferocious from space. El Niño-fueled warm water is turning the Pacific Ocean into a hurricane factory this year. A combined index of hurricane strength and longevity off the coast of Mexico is at 151 percent of average in 2014. 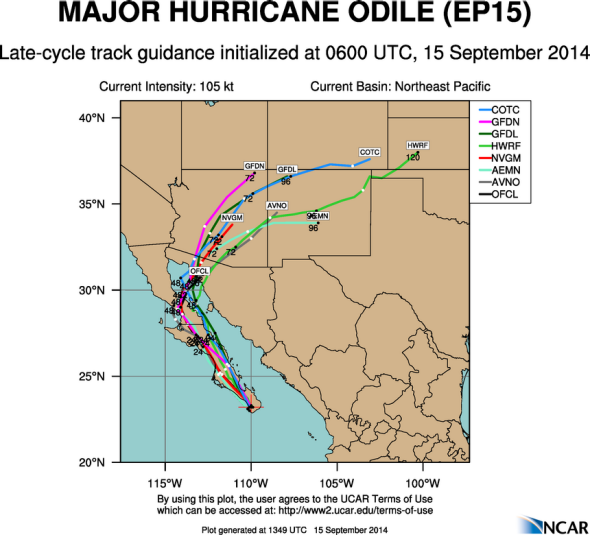 Odile comes just days after a surge of moisture from Hurricane Norbert brought Phoenix its rainiest day in history. Late last month, Hurricane Marie, one of the strongest Pacific hurricanes ever measured, made for an epic day of surfing in Southern California. Odile, too, will affect the Arizona desert this week, bringing another round of tropical moisture at off-the-charts levels. On Sunday night, National Weather Service meteorologists from Las Vegas, Tucson, Phoenix, and Flagstaff organized an impromptu Twitter chat that spurred hundreds of comments from people nervous about the potential for back-to-back major flood events. As I mentioned last week, deluges like these do comparatively little to blunt the effects of ongoing drought in the Southwest, since most of the rain finds its way into gullies and riverbeds. As the climate warms, more rainfall is expected from heavy downpours, further taxing local attempts at flood management. And just like Norbert, most of the rains from Odile will miss the U.S. state of California, where drought lingers at levels not seen in hundreds of years. Odile is bound for Arizona next.